WHAT MOTIVATES PEOPLE TO GO UNDER THE KNIFE? Cosmetic surgery can be a rewarding and life-changing experience for the right patient, but what motivates people to go under the knife? Alice Hart-Davis investigates. Trying to get a fix on the psychology of cosmetic surgery is a bit like looking through a kaleidoscope. Shift the focus a bit and the whole picture changes. Is surgery empowering, enabling women – and, increasingly, men – to change their looks as they see fit or is it simply indulging vanity? It depends who you ask. As Norman Wright, a psychotherapist who works with cosmetic surgery patients, points out, given the numbers of people suffering with body dysmorphic disorder – 600,000 cases diagnosed and many more, surely, undiagnosed – the likelihood of prospective cosmetic surgery patients having underlying emotional or psychological issues is high, which is a problem for surgeons. 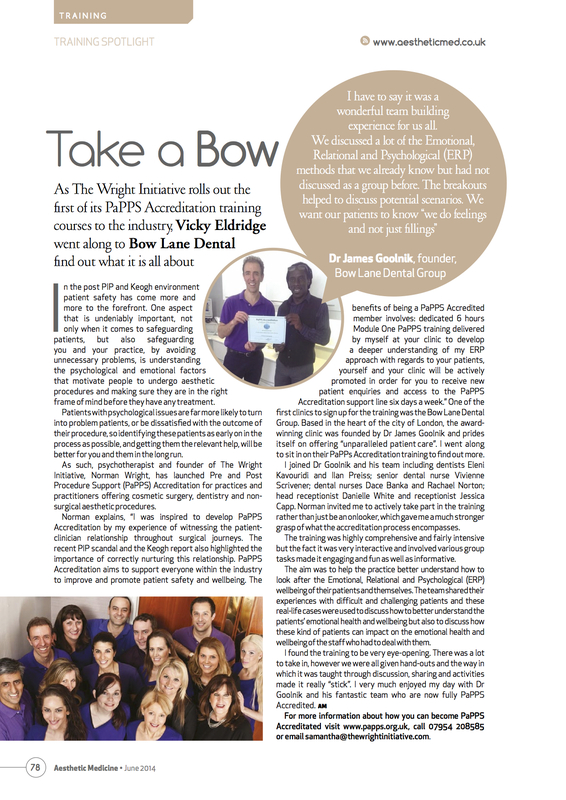 Vicky Eldridge from Aesthetic Medicine Magazine reports on a PaPPS Accreditation training course run by Norman Wright. 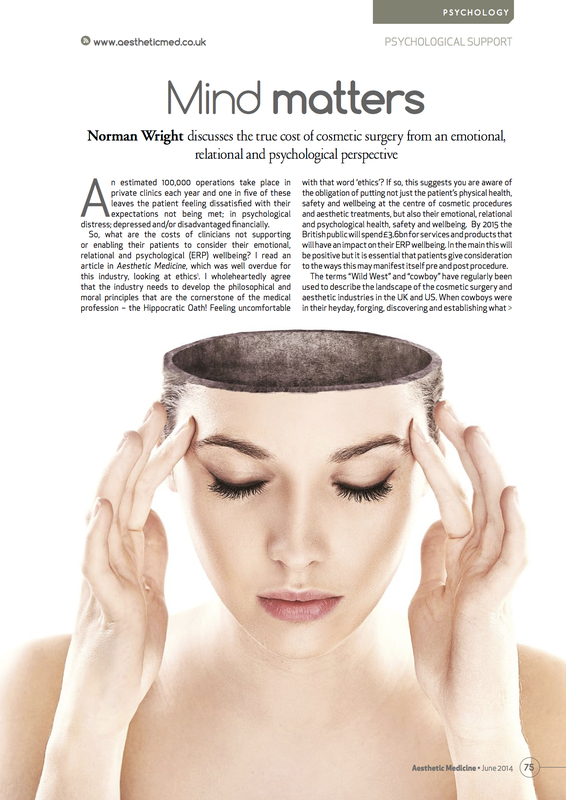 Norman Wright discusses the true cost of cosmetic surgery from an emotional, relational and psychological perspective. This article appeared in Aesthetic Medicine Magazne June 2014. The Body Matters panel, launched by GC Aesthetics, is committed to giving women the most thorough information, support and advice before they consider embarking on the physical and emotional journey of breast surgery. Norman answers such questions as: How important is family support during breast augmentation? Antonia Mariconda spends a Day in the Life of leading psychotherapist and founder of The Wright Initiative, Norman Wright. 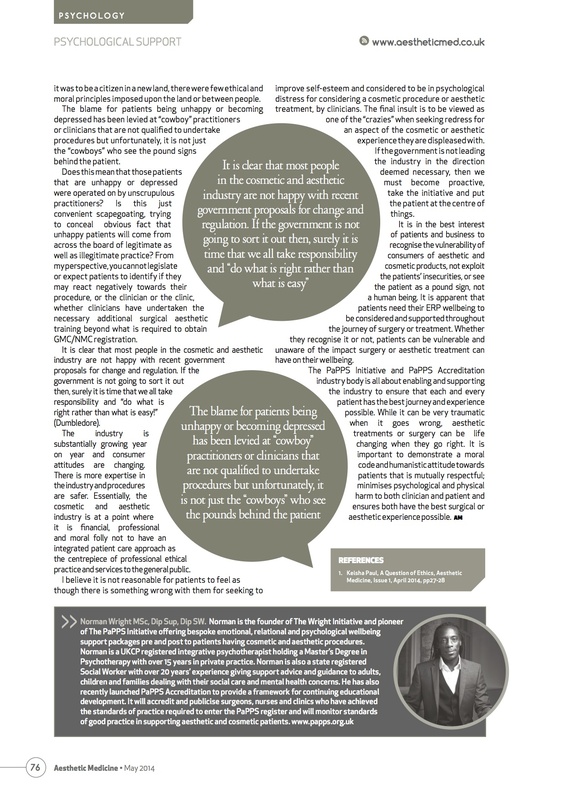 With the British government now shining a spotlight on the cosmetic surgery industry with proposals for reforms and tighter regulations to be implemented, leading psychotherapist Norman Wright, MSc, Dip Sup, Dip SW, and founder of The Wright Initiative has pioneered a support programme for prospective aesthetic and cosmetic surgery patients to address their emotional wellbeing as well as their desire to improve their physical appearance. Here, Norman takes time out from a hectic schedule to talk to Antonia Mariconda about a day in his life. “Home is Nottingham, where there is never a dull moment, I am blessed with a fantastic family; which includes a wonderful son and daughter. I wake at 6.30am every morning. This is my time! We’re strange creatures of habit us humans aren’t we? Hence why I always start my day with a slice of wholemeal toast, real orange juice and real coffee, the real stuff makes all the difference. I confess I am not a dedicated gym visitor but I do my morning crunches and my morning Yoga Asana’s as well as meditation. I travel to work by car, I listen to Jazz FM which uplifts and soothes me in preparation for my day ahead, my working day normally starts at 8.30am. When I arrive at work I check the emotional temperature of the space and how it fits in with my own. I then meet with my Practice Manager to go through my day. There is no set routine in what I do, so it would be hard to describe a ‘typical’ morning, but I usually I will see a combination of clients, and do some reading for the panels on which I sit on or ensure with the marking of various assignments for my students on their BSc programme. My mornings are always busy and diverse. Variety is a wonderful thing to work with in any profession: variety. I am a pescatorian and my absolute favourite is sea bass, so whenever I get the chance I will stop for lunch. I qualified from Derby University and The Sherwood Psychotherapy Training Institute in Nottingham. My previous role was changing so much that I decided to retrain in order to do a job that actually makes a difference to people’s lives as well a realising my own value, worth and skills. There have been so many people that have inspired me in my life including my Mother, Frantz Fanon, and Homer Simpson. It is an honour and privilege to journey with clients and students as they embrace, discover and appreciate themselves in a new way. I have pioneered my PaPPS Initiative (Pre and Post Procedure Support) as a consequence of becoming aware that as a Psychotherapist the skills I have can be extremely beneficial in addressing the Emotional, Relational & Psychological wellbeing of cosmetic surgery and aesthetic patients. This is currently lacking in the cosmetics and aesthetics industry. I created PaPPS to satisfy the consumer driven market that patients need. The British Government are now realising and looking at the psychological wellbeing of patients as an integral part of the journey. PaPPS is a support programme that not only addresses the psychological wellbeing it also ensures peace of mind for both the patient and the surgeon. I encourage all surgeon’s and clinics to have PaPPS as part of their patient pathway. We are being constantly reminded how important it is to be mindful of our body image and it seems to me that the idea of looking as good as you can for as long as you can is an innate need of human beings that is being capitalised by society in many ways. The Cosmetic Surgery and Aesthetics industry is constantly growing and evolving, clearly many treatments and procedures increase the self-esteem and confidence of patients, but more support is needed for when things do go wrong as we know that they do. Much like my mornings, my afternoons will include the addition of clinical supervision or my own personal supervision or teaching as well as SKYPE sessions with clients. A typical day is always busy, and no two days are ever the same. Since time immemorial, human beings have strived to make themselves as attractive as they can. I do not see this going away anytime soon. With the addition of developing technology and media, the concept relating to the importance of body image have become even more pronounced in society as a whole. In five years’ time I hope to complete my PhD and start up a number of retreats for Mind, Body and Soul. Antonia Mariconda also known as ‘The Cosmedic Coach’ is a health and beauty writer, and author of four books. She is quoted in national and consumer press such as the BBC, Top Santé, The Evening Standard, Daily Mail, and Metro, for her knowledge on beauty and aesthetics, and cosmetic surgery. Antonia also independently advises clients both from the UK and around the world on where and where not to shop safely for cosmetic surgery, beauty, aesthetic medicine, and anti-ageing treatments. Her client list includes A-list celebrities, Royalty and VIPs. Should Cosmetic Surgery come with a Mental Health Warning? With an increasing number of people seeking cosmetic surgery, the demand for therapeutic support has risen. Pre- and post-operative evaluation is essential in helping the surgeon to assess the Emotional, Psychological & Relational (ERP) wellbeing of the patient. The goal of The Wright Initiative is a simple one: they believe that every patient should be able to make an informed decision about the procedure they are interested in. This means ensuring that the patient considers, among other things, the impact that cosmetic treatment may have on their ERP wellbeing, both in the short-term and in the more distant future. Is the patient prepared – mentally and physically – for the changes they will experience after surgery?